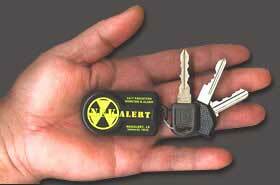 Civil Defense Radiation Detectors & Detection Meters FAQ & Geiger Counters radiation safety! NYTimes (6/13/02), Wall Street Journal (3/14/03 & 10/5/01), USAToday (6/11/02 & 7/11/02), Washington Post (4/13/03 & 3/16/03), Boston Globe (8/13/05), SF Chronicle (6/23/02), Newsday (11/24/01), WND (1/18/05), IEEE Spectrum (9/01), Bulletin of the Atomic Scientists (5/04), National Defense Mag (3/04). And, our products seen on CNN, FOX, CBS, TIME mag with radio interviews on 'Coast to Coast', NPR, Glenn Beck and numerous others, also Glenn Beck's CNN TV Show - 10/12/2006! 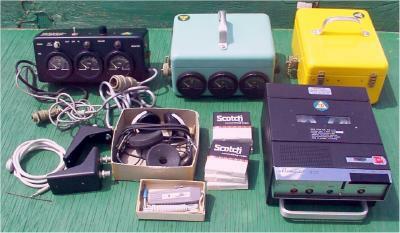 Geiger Counters FAQ & for sale meters! with source to buy newly calibrated or calibrate yours! Who is KI4U and what is the Purpose of This FAQ? Who Needs Radiation Detection Instruments? What's the Difference Between Radiation Detection Survey Meters, Geiger Counters and Dosimeters? How Good Are These Civil Defense radiation Detectors Survey Meters? What Are the Different Types of Civil Defense Radiation Detection Survey Meters? Which Survey Meter Would Be Best For My Safety Needs? 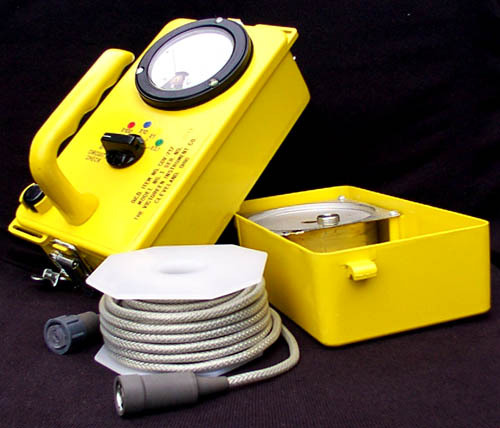 Where Can You Buy or Find For Sale a Quality Civil Defense Radiation Detection Survey Meter? What's RadMeters4u.com Approach & Commitment? What about Dosimeters and Chargers? I Already Have a Radiation Detection Survey Meter, Can You Calibrate It? What other type meters & training in their use are available? NEW RADSticker™ peel & stick Instant Dosimeter! 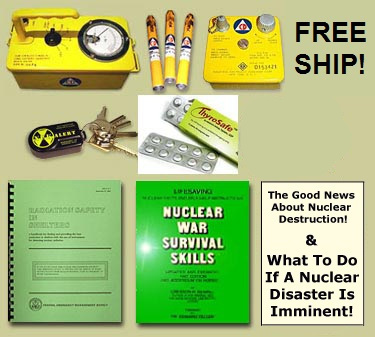 Nuclear Blast & Fallout Shelters FAQ with free plans, guides & ready made shelter sources! Trans-Pacific Fallout from Japan, Iran, Korea, India, Pakistan, etc. From Cold War Relics To A Calibrated First-Line of Defense! Q: Who is KI4U and what is the Purpose of This FAQ? 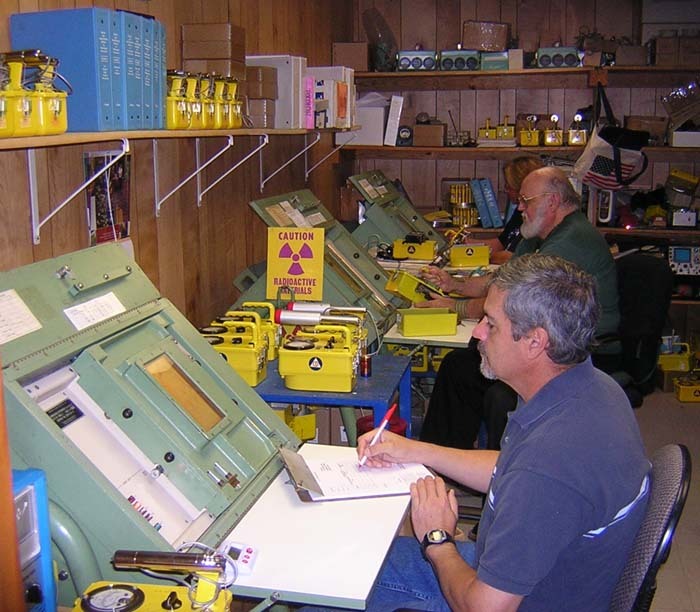 A: KI4U, Inc., is the only private radiological laboratory in the nation specializing in calibrating & re-certifying all of our country's Civil Defense radiation detection survey meters and dosimeters, AND with over 100,000 instruments, and over 6 million doses of Potassium Iodide (KI), have ready for sale our largest emergency stockpile of both in the nation. (Yes, we can also calibrate your surplus Civil Defense meter.) We also produce the popular NukAlert™ key-chain radiation detector & alarm and are exclusive source of the new RADSticker™ dosimeter. See them all here! More about all that we do preparing First-Responders and fellow Americans, including FREE family nuke prep survival guides HERE! Also, See where our proposal for re-instituting national civil defense training of the public was voted & ranked #1 at DHS & FEMA National Dialogue on Preparedness. We are the authors of the popular Potassium Iodide (KI) Anti-Radiation Pill FAQ and Fallout Shelters & Nuclear Civil Defense FAQ. From the first week of having launched that original KI FAQ in 1999 we've had inquiries about, and requests for advice on, personal radiation detectors, like the inexpensive FEMA surplus Civil Defense radiation detection survey meters, Geiger counters and dosimeters available and for sale on the market. We quickly discovered, though, that the most reliable sources for information about these Civil Defense radiation detecting survey meters, geiger counters and dosimeters was from the radiological technicians who are employed by FEMA, or under contract with FEMA, or work in state calibration labs, to maintain, repair and calibrate these same meters. The initial goal throughout all of this process has been to first establish and confirm the inherent reliability and practical applicability of these Civil Defense radiation detection survey meters and dosimeters for use in a nuclear emergency. We found them to be well field-proven for decades, which explained why, to this day, thousands of First-Responders nation-wide still rely upon them confidently. In the Spring of 2001 we acquired a large quantity (120,000+) of FEMA Civil Defense radiation detector instruments from the Federal Depot in Fort Worth, Texas. This included survey meters, Geiger counters, dosimeters, chargers, test equipment, and current FEMA Repair and Maintenance Manuals. Most importantly, though, we then also hired experienced FEMA trained technicians for our calibration lab here. Our full-time RSO (Radiation Safety Officer) and lab director here, has served as an RSO on three separate licenses. He began his career in the early 60's at Oak Ridge National Labs and subsequently served at both Los Alamos National Laboratory and PanTex Nuclear Weapons Plant facility, as well as numerous nuclear power plants. He was a consultant to the Safeguards Program focused on developing the anti-terrorism strategies for nuclear facilities in the US. He was also the Chairman of the Nuclear Technology Program at a southern university for seven years and is the author of five books on the subject. Also, while at the Texas Bureau of Radiation Control, he not only repaired, maintained and calibrated these same FEMA Civil Defense radiation detector instruments, but was a certified instructor in the proper use of them in a nuclear emergency. Our goals and commitments in both processing, calibrating and distributing these instruments to emergency agencies and the public are covered in greater detail below at the Q&A section entitled: What's RadMeters4u.com Approach & Commitment? Q: Who Needs Radiation Detection Instruments? A: The reasons for acquiring a radiation detecting survey meter, Geiger counter and/or dosimeter are as varied as are peoples perceptions of the most likely threats. Radiation threats are unique in that you can't see, smell, taste, hear or feel them, until it's already done its damage and you are suffering the effects. Without a radiation detector you would have to depend solely on the limited resources of the authorities to monitor your location, then determine your risk level, decide the best protective action and then to 'get the word out'. Accidents involving non-waste, but normal daily nuclear materials transport (trucks, planes, trains, couriers) One out every 50 HazMat shipments contain radioactive materials. Approximately three million packages of radioactive material are shipped in the United States each year. An attack on, or sabotage of, a nuclear power plant. Or, conventional explosives used to disperse radioactive materials (dirty bomb) to effectively contaminate an area and much within in it. Or, food or water supplies could be contaminated with radioactive materials. Or, a strong radioactive source could be placed in a location adjacent to where large numbers of the public would file past. They could be unknowingly and dangerously exposed to it, such as at a subway que, cinema, or sports stadium, etc. Many find that improbable today, but the Russians apparently don't, as reported here on July 12, 2010: "Moscow arms against nuclear attack - Nearly 5,000 new emergency bomb shelters will be built in Moscow by 2012 to save people in case of potential attacks. Moscow authorities say the measure is urgent as the shelters currently available in the city can house no more that half of its population. In the last 20 years, the area of air-raid defense has been developed little, and the existing shelters have become outdated. Moreover, they are located mostly in the city center, which makes densely populated Moscow outskirts especially vulnerable in the event of a nuclear attack. In order to resolve the issue, the city has given architects a task to construct a typical model of an easy-to-build shelter that will be located all over the city 10 to 15 meters underneath apartment blocks, shopping centers, sport complexes and parks, as in case of attack people will need to reach the shelters within a minute." A survivor in a shelter that does not have a dependable meter to measure fallout radiation or that has one but lacks someone who knows how to use it will face a prolonged nightmare of uncertainties. Human beings cannot feel, smell, taste, hear, or see fallout radiation. Bottom Line: Having on-hand an inexpensive radiation detecting meter in this day and age is cheap family insurance and, like major medical insurance, we can also hope & pray never to have to use it! Also, like any real insurance, it'll be near impossible to get one after something has happened! Bottom Line: All three of the primary types of radiation above can be a hazard if emitted from radioactive material that was inhaled or ingested. Protected food and water and even a simple inexpensive dust protector face mask can go a long ways to denying this route of entry. However, for the penetrating gamma rays, it is essential to be able to measure the strength of this type of radiation to then discover the best protected shielding and distance options available. (See our FAQ entitled Nuclear Blast & Fallout Shelters FAQ for an understanding of nuclear bomb effects, fallout, and effective sheltering options.) Also, in a shelter or home, besides revealing the safest locations there, knowing the intensity of the local gamma radiation outside will better indicate when it is again safe. Or, safe enough to perform a brief essential chore outside. More information on the specific physical damage caused by gamma radiation is below in the section entitled: Which Survey Meter Would Be Best For My Needs? Bottom Line: Fortunately, cutting through the above confusion, for purposes of practical radiation protection in humans, most experts agree (including FEMA Emergency Management Institute) that Roentgen, Rad and Rem can all be considered equivalent, especially in an emergency. The exposure rates you'll usually see will be expressed simply in terms of roentgen (R) or milliroentgen (mR). For details on how much is too much "R", see the Q&A section below entitled: Which Survey Meter Would Be Best For My Needs? Q: What's the Difference Between Radiation Detection Survey Meters, Geiger Counters and Dosimeters? Survey meters, field survey meters, rate meters, radiac meters, radiation detection meters, low-range meters, high-range meters, airborne meters, fallout meters, remote monitors, Geiger counters, and even 'dose rate meters' are all describing instruments, equipment and devices that detect and measure exposure rate or the intensity of radiation at a location at some point in time. It's like the speedometer of a car; both present measurements relative to time. 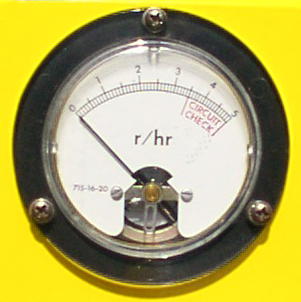 All of these above radiation detector 'meters', the Geiger counter, too (which utilizes a Geiger tube rather than an ion chamber), will show their radiation intensity readings relative to time, such as R/hr or mR/hr like the scale at the right, same as a car speedometer will show miles/hr. If you entered a radioactive area and your meter says 60 R/hr then that means if you were to stay there for a whole hour you would be exposed to 60 R. Same as driving a car for an hour at 60 mph, you'd be 60 miles down the road after that hour, at that rate. Dosimeters, which are also available in high or low ranges, can be in the form of a badge, pen/tube type, or even a digital readout and all measure exposure or the total accumulated amount of radiation to which you were exposed. 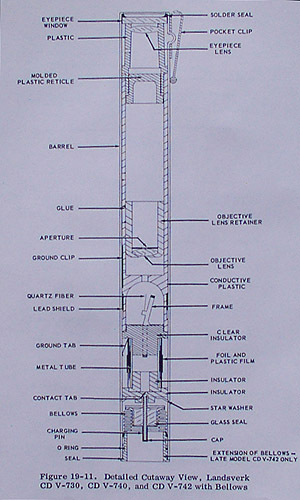 (The Civil Defense pen/tube type would show a reading like at the right when looking through it.) It's also similar to the odometer of a car; where both measure an accumulation of units. The dosimeter will indicate a certain total number of R or mR exposure received, just as the car odometer will register a certain number of miles travelled. More in-depth details regarding dosimeters follows below in the section entitled; What about Dosimeters and Chargers? 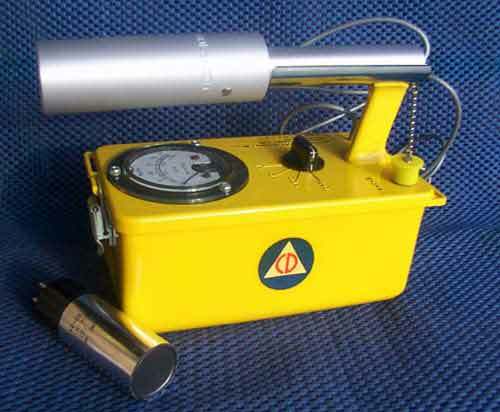 Bottom Line: Both meters and dosimeters have their place, and their limitations, in indicating the presence of hazardous radiation levels, and when utilized by a person with the basic understanding of what they are each measuring, they can be critical life-saving tools to survival in a nuclear emergency. Q: How Good Are Surplus For Sale FEMA Civil Defense Radiation Detector Survey Meters, Geiger Counters and Dosimeters? 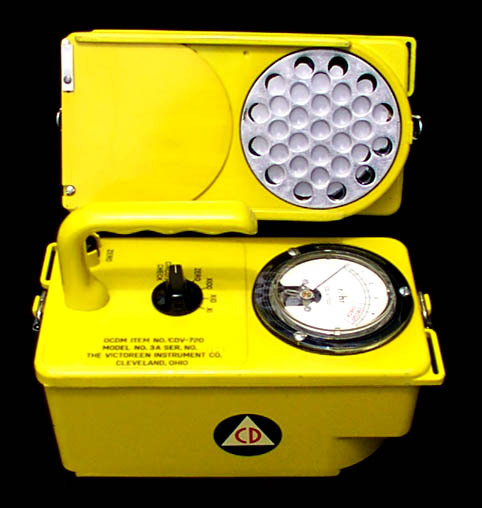 All the technicians variously described the properly maintained, calibrated, and stored Civil Defense radiation detector survey meter and dosimeter as "accurate", "reliable" and "dependable". Many of these same technicians and radiological officers are also atop the call lists in their respective states for any radiological emergency and many of these same radiation detector survey meters and dosimeters are what they will be confidently responding with. They know them well and trust them. However, surplus or auction acquired Civil Defense radiation detector meters and dosimeters are often brought onto the market with little or none of their previous history known of their maintenance, repairs, last calibrations, and past storage conditions. Many of these units, unlike the reliability proven units described above and maintained on a regular basis, may have been out of that maintenance 'loop' for as long as 20 years or more. Or, they may be new-in-the-box units, produced in the 60's or 70's, that never even got into the maintenance 'loop'. The functionality, reliability and accuracy of any particular individual surplus Civil Defense meter or dosimeter can not be assumed, until actually verified and proven to be so. We know this from the experience of culling out the bad units from amongst the good as we've evaluated, tested, and had calibrations attempted on literally tens of thousands of these same surplus radiation detector meters and dosimeters since early summer of 2001. (We have well over 100,000 of them here in our facility. See photos of our warehouse and lab below.) Many of these surplus meters can be every bit as reliable and accurate as those described above, but it first requires a systematic evaluation and testing process to identify them. More on that essential process is covered below in the Q&A section entitled: "Where Can You Buy a Quality Civil Defense Survey Meter?" and at "What's RadMeters4u.com Approach & Commitment?" Bottom Line: We found the above positive sentiments by FEMA technicians so universal, and witnessed the successful tests and calibrations of enough regularly maintained meters, that we are confident that a properly maintained, calibrated, and stored Civil Defense radiation detector Survey Meter or dosimeter will give its owner very reliable and accurate service. The goal then needs to be to assure that you acquire only a quality Civil Defense meter or dosimeter that is first proven to be fully up to these maintenance, calibration and storage standards. Q: What Are the Different Types of Radiation Detection Civil Defense Survey Meters? A: Amongst the Civil Defense Radiation Detection Survey Meters there are four primary types, one low-range meter and three high-range meters. (There was one other high-range meter, the plastic encased CD V-710, that we don't see much of anymore, was dropped by FEMA early on, and will not be including it here.) The following three survey meters are the most common Civil Defense high-range meters. The detector on all these high-range survey meters is an ionization chamber. It measures gamma radiation. 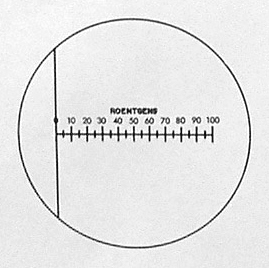 The R/hr in the ranges indicated below refers to Roentgen per hour exposure rate. They each have a 1-5 numbered meter range and four multiplier scales: X100, X10, X1 and X0.1, with the exception of the CD V-720, that does not have the X0.1 scale. The CD V-715 and CD V-717 with the multiplier scale, X0.1, provides that the 0 - 5 range would be read as 0 - .5 R/hr when it's selected. The other differences between the three radiation detection units is that the CD V-717 includes a 25' cable for remote sensing and the CD V-720 employs a sliding beta shield on the bottom to allow for beta radiation detection, too. However, the CD V-720 has some reliability issues and while we will still calibrate a customers meter, we do not sell them here. FEMA generic basic operating instructions for high-range meters and dosimeters is here. 5.25 pounds, 3-part die cast aluminum case, watertight, will float. Powered with one D-sized battery, continuously for 150 hours, longer if on intermittent basis. Instrument accuracy on any of its four ranges is within +- 20% of true dose rate. Use of remote cable (25') should not degrade accuracy more than 5%. Detachable bottom section, containing ion chamber, can be set up for remote sensing with included cable. 3.75 pounds, 2-part die cast aluminum case, watertight, will float. Powered with two D-sized batteries, continuously for 150 hours, longer if on intermittent basis. Instrument accuracy on any of its three ranges is within +- 15% of true dose rate. (It does not have X0.1 range.) Has sliding shield door on bottom to allow detection, though not measurement, of beta particles. The CD V-720 has some reliability issues and while we will still calibrate a customers meter, we do not sell them here. 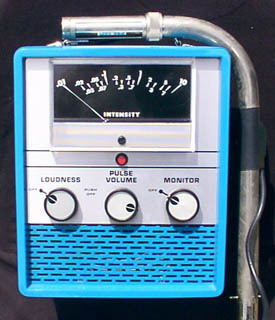 The detector on the CD V-700 is a Geiger-Mueller (GM) tube. It measures gamma radiation. It has a check source on the side and a headphone jack. The range selector switch allows you to measure up to 50 mR/hr. A milliroentgen (mR) is one thousandth of a Roentgen (R). The probe on the CD V-700 has a section in the center which rotates to expose a window for also detecting beta. When the window is open it detects both beta and gamma. This survey meter is calibrated only for gamma radiation, so you can not get an accurate reading of the exposure rate from beta particles, only an indication of their presence. 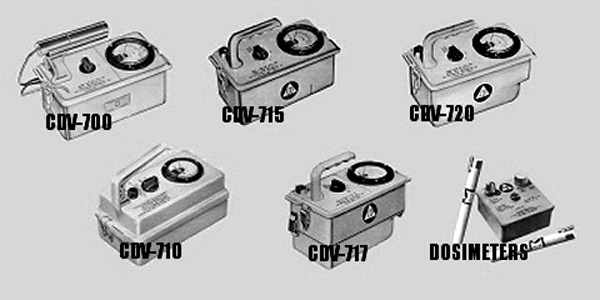 The CD V-700 is a low-range meter more suited for peacetime use than the above three high-range CDV-715's, 717's and 720's. According to the 1993 FEMA publication #SM 320 "Fundamentals Course for Radiological Monitors" states: "It is only able to measure up to 50 mR/hr and unit may become "saturated" in a higher field of radiation and act erratically, even to the point of giving false low readings in radiation fields exceeding 1000 mR/hr (1 R/hr)." Q: Which Radiation Detection Survey Meter Would Be Best For My Needs? A: The first decision in selecting a radiation detector survey meter is choosing whether a high-range meter or a low-range meter would best suit your goals and needs. A survey meter will be used to help make critical decisions, such as to flee, how far, and to where. Or, to stay in-place, and if staying then in determining the best protected location in your home or shelter. Then, later, for determining when it is safe again and until then, when and for how long someone could briefly exit the protected area to perform a critical chore, etc. Key to that high or low range decision should be to first understand and then determine the levels of radiation exposure one should be most concerned about in a nuclear emergency. Then the correct range radiation detector meter best suited for the job will be readily obvious. The following is compiled from FM 3-7. NBC Field Handbook, 1994. FM 8-9. NATO Handbook on the Medical Aspects of NBC Defensive Operations, 1996. FM 8-10-7. Health Services Support in a Nuclear, Biological, and Chemical Environment, 1996. It is instructive in outlining the levels of radiation and their health effects. It should be readily apparent now that the more dangerous levels of radiation are well beyond the capability of a low-range radiation detector survey meter, such as the CD V-700, which would be maxed out at 50 mR/hr which is only .05 R/hr. (A low-range meter is better suited for verifying successful decontamination and/or checking for low-level contamination in food or water.) With that meter alone, and maxed out, you would not know if you just walked into a 1 R/hr field or a potentially fatal 500+ R/hr environment. Instruments that measure only milliroentgen-range dose rates are sold for war use by some companies. Since most Americans have no idea what size of radiation doses would incapacitate or kill them, and do not even know that a milliroentgen is 1/1000 of a roentgen, some people buy instruments that are capable of measuring maximum dose rates of only one roentgen or less per hour. The highest dose rate that it can measure, one roentgen per hour, is far too low to be of much use in a nuclear war. Bottom Line: Low-range and sensitive Geiger counters, like the CD V-700, do have their place, and we offer them here, but without a higher-range radiation detector survey meter first, and initially, warning you away from exposure to excessively high levels of lethal radiation, the opportunity to later even use a low-range radiation detector meter may never come! OK, so if it's a high-range survey meter we would need first, then which Civil Defense high-range survey meter is 'the best'? #1 - Any of the high-range radiation detection Civil Defense meters will work just fine IF it has been properly maintained, stored, and calibrated. Also, calibration no more frequently than every 4-6 years is normally sufficient IF shelf-bound and stored properly, but is much more frequently required if subjected to rough handling, for example, bouncing around in the trunk of a car. Also, they emphasized that the calibration needs to always be with a sufficiently strong enough radioactive source that a mid-scale meter reading can be attained for all the ranges, not just the lower ranges. #2 - Universally, when pushed to rank them, most all of them said their preference for a particular CD survey meter model was in the following order: CD V-715, CD V-717, CD V-720. Asked to elaborate why this personal preference and most said it was for the lighter weight of the CD V-715 over the other two and the basic KISS principle in that the CD V-715 had no frill 'bells & whistles' that might invite complications in the field. 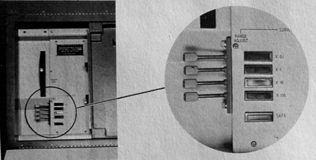 Also, many were openly critical of the CD V-720 design 'feature' of its sliding beta shield for attaining beta readings. They felt it was more of a marketing 'feature' than of any real practical use. They also found it required more maintenance attention as it was more prone to allow the intrusion of humidity and dirt and/or contamination internally. We also inquired how comfortable they were with used and visibly worn Civil Defense survey meters compared to any of the same type new and largely unused meters available there on their shelves, too. They made it clear that it didn't matter, used or new looking, just so long as it was properly maintained, calibrated, and stored until needed. If called on to respond to a radiological emergency, they would rush out the door with whatever unit, new or used, was known to them to of been properly maintained, calibrated, and stored correctly there. Q: Where Can You Buy a Quality Radiation Detection Civil Defense Survey Meter? 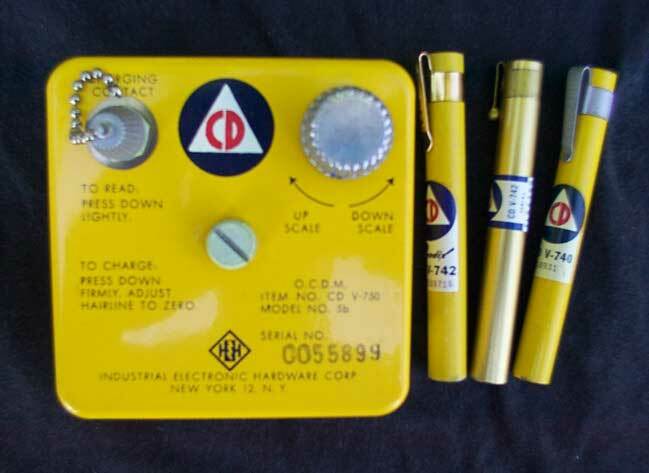 A: Civil Defense radiation detection survey meters used to come on the market via very infrequent, but sometimes very large, FEMA auctions ever since the Federal government, in the 1st Bush and then Clinton administration, de-funded the FEMA/state partnerships that had previously maintained our national nuclear Civil Defense program. Now most govt auctions are by states, rather than FEMA. They are most often bid on by surplus wholesalers, but sometimes by other unrelated businesses and even individuals hoping to turn them for a quick profit. They buy them by the pallet load lots, perhaps 40-80 pallets per lot and as many as a dozen lots or more in any one auction. But, of course, these auctions can be bigger or smaller, too. Once acquired they are then typically sold in smaller lots to other wholesalers and any business that might have a potential customer base interested in them retail, such as Army/Navy surplus stores, preparedness companies and internet based companies catering to the same type clientele. Most all these potential outlets are interested in moving them out with as little additional input (time/money/energy) as is possible. While that's understandable business-wise, you'll need to be aware of what these meters are, and are not, likely capable of when you consider getting yours, especially when they tell you that "it works", and that's what you are relying upon. As of August, 2010 we've successfully calibrated and certified literally over 25,000 of the 100,000+ Civil Defense meters and dosimeters we'd acquired from the Federal Depot in 2001, along with countless hundreds more from state and municipal agencies and individuals who have sent theirs into us for calibration. We are the only private calibration lab in the country that specializes in re-certifying and calibrating all the Civil Defense meters and dosimeters. Typically, amongst surplus meters the public might attain from various sources, we see only about 65% that are functioning sufficiently enough to even have calibration attempted on them without some maintenance or repair work first. Many of these meters will actually pass the basic 'circuit check' test, but still require essential repair work before calibrating. Also, without exception, all surplus Civil Defense meters, whether they needed some repair work first or not before attempting to be calibrated, still had to have that calibration adjustment and fine-tuning to bring them back into even the minimum required accuracy specified to be certified. 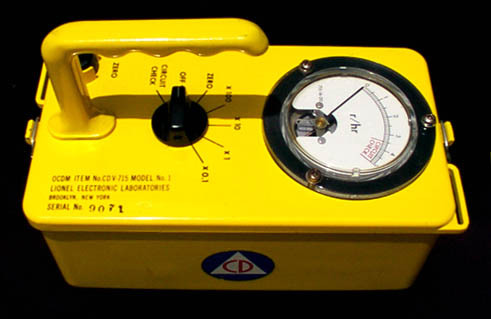 What this all means to you in selecting and acquiring a Civil Defense radiation detector survey meter is that when the seller says simply "It works." or "It passed the circuit check test. ", they likely have only dropped a couple batteries in it and performed the 'circuit check' to arrive at those conclusions. And, it's 35/65, those meters might not be functioning sufficiently enough for them to even be later calibrated... without repair work first. And, even less likely that you'd be getting a functioning meter whose last calibration, who knows when, was still holding accurately enough that you didn't need to have the calibration re-done again. (Also, you won't know how well its been handled or stored since that last calibration either.) And, you will never know, unless and until you then get it re-calibrated yourself. Buy an untested surplus meter and send it off to a qualified calibration certification lab, like ours here. Buy a newly manufactured high-range survey meter for $1,000+. Q: What's KI4U Approach & Commitment? A: Our approach and commitment here is identical to that we've held at our Potassium Iodide Anti-Radiation Pill FAQ at ki4u.com since 1999, where we strive to provide both the best current information and products, and at prices to where more families can then get prepared, both correctly and confidently. We have, and will continue to, invest the time, money, and energy to assure the best sources of radiation protection information and products at affordable prices for families wanting to acquire these essential Civil Defense radiation detection survey meters and dosimeters. 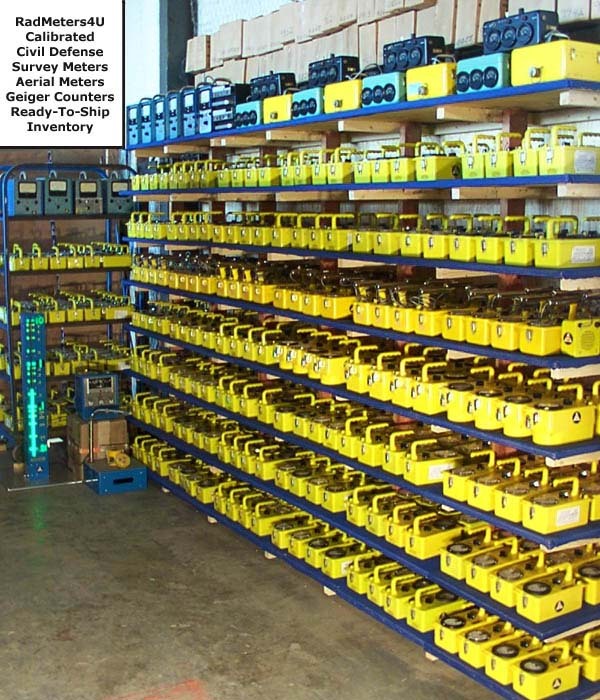 To this end we had acquired in the Spring of 2001 the above mentioned 100,000+ items of FEMA Civil Defense survey meters, Geiger counters, dosimeters, chargers and test equipment. (And, hired qualified FEMA trained technicians!) A total of 416 pallet loads were trucked in from the Federal Depot in Fort Worth to our 5,200 square foot warehouse here in Gonzales, Texas. The building is also home to our calibration labs where, with a trained staff of a dozen now, we are processing, evaluating, testing, grading, calibrating and, as necessary, overhauling these meters and dosimeters. We are also re-calibrating the meters for numerous state and municipal agencies as well as for the general public. We hold a Radioactive Material License issued by the State of Texas for operation of our three CD V-794 Cesium calibrators, and other sources, here at our location. All of our personnel have successfully completed both the General Employee Radiological Training and the Radiation Worker Training courses, as well as specialized training on the calibration equipment. Carl Kee, our full-time RSO (Radiation Safety Officer) and lab director here, has served as an RSO on three separate licenses. He began his career in the early 60's at Oak Ridge National Labs and subsequently served at both Los Alamos National Laboratory and PanTex Nuclear Weapons Plant facility, as well as numerous nuclear power plants. He was a consultant to the Safeguards Program focused on developing the anti-terrorism strategies for nuclear facilities in the US. He was also the Chairman of the Nuclear Technology Program at a southern university for seven years and is the author of five books on the subject. Also, while at the Texas Bureau of Radiation Control, he not only repaired, maintained and calibrated these same FEMA Civil Defense instruments, but was a certified instructor in the proper use of them in a nuclear emergency. 24-hour heat room low moisture dry out. Successful completion of the above procedures has the meter then qualified to attempt calibration to mid-range of all it's scales. 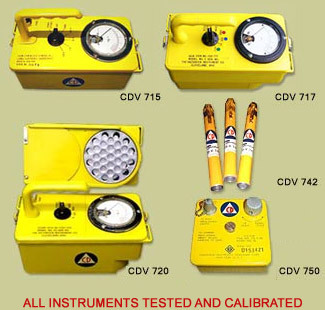 All calibration certifications of these Civil Defense survey meters is accomplished here with the CD V-794 calibrators built specifically for these type meters. This calibrator utilizes a N.I.S.T. traceable Cs-137 source that tests and calibrates (adjusts) mid-scale for all the ranges strictly in accordance with industry standards. KI4U, Inc. is licensed and authorized by the State of Texas to perform these calibrations at our lab here conforming to the standards as set forth by the State of Texas, FEMA, ASTM and the NRC. After successfully calibrating the unit on all scales, they are then certified fully ready for reliable, accurate and confident service in the field. Successfully calibrated instruments are returned with the label below affixed to them certifying their calibration and stating who calibrated it and when, along with the serial number and model designation. Additionally, a Certificate of Calibration with the actual before and after accuracy responses for each of the different ranges available on the instrument is included. And, they are available for a fraction of the cost of a new high-range survey meter today that would cost you $1,000.00+! The delivered prices within the USA for our calibrated Civil Defense survey meters can be seen here! Q: What about Dosimeters and Chargers? A: Dosimeters and their required Chargers should be readily seen as an important additional asset by anyone that already understands the need for a survey meter. The direct-reading pocket dosimeter is a portable instrument designed to measure the total dose of moderate and high levels of gamma radiation. The common dosimeters are designated the CD V-138, CD V-730, CD V-740, and CD V-742. The instruments make use of a small quartz fiber electroscope as an exposure detector and indicator. An image of the fiber is projected onto a film scale and viewed through the eyepiece lens. 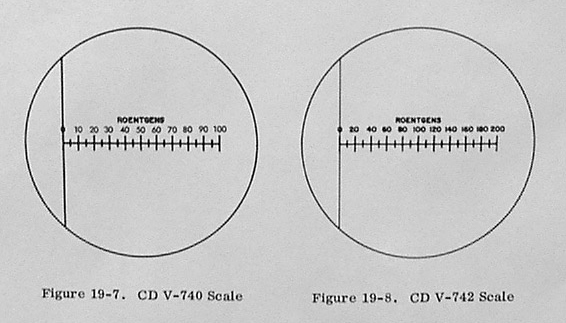 The scale is calibrated in milliroentgens (mR) or roentgens (R), depending on the model, and may be read by looking through the eyepiece toward a lamp or other source of light. A CD V-750 or 756 dosimeter charger must be used in conjunction with the dosimeter to set the instrument to zero. The charger may also be used to read the scale. FEMA generic basic operating instructions for dosimeters and high-range meters is here. The "Operating and Maintenance Instructions", that come with each CD V-750/756 charger, explains how to zero your dosimeter with the charger. However, something we hadn't seen addressed in them, is that the fiber image may shift slightly when the dosimeter is removed from the charger. This hairline "kick" is a common occurrence, particularly on the lower-range dosimeters. Simply repeat the charging procedure until a zero reading is obtained. If this is difficult, a poor ground condition at the charging pedestal is likely. This condition may be more pronounced if the charger has not been used for a period of time. 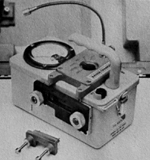 Dosimeters can be defective, too, like any instrument. Electrical leakage in dosimeters creates movement or drift of the fiber from an initial setting OR towards an up-scale reading without the presence of radiation. There can be half-a-dozen reasons why, but typically it is caused by contaminates in the manufacturing process, outgassing of internal components, such as plastics, or broken hermetic seals allowing humidity intrusion. FEMA current requirements for field dosimeters is for electrical leakage to not exceed 5% of full scale for a 50 degree C five day test. (Maximum leakage limit is 1% of full scale per day.) The test procedure requirements are quite a bit more involved than just slow cooking them for five days, but that's the primary objective to encourage failure in any units prone to these problems. Any dosimeters failing to meet this standard are considered defective and should be repaired. Dosimeters need to also then be tested for accuracy by being exposed to a known radiation source that should hit mid-scale on their particular range. (Dosimeters are not completely linear and the only provided calibration points are always mid-scale.) FEMA specifications require that dosimeters should respond to within plus or minus 10% of true dose. But, because the calibrator 'box' geometry (positioning) and radiation scatter components makes absolute calibration impossible, they allow a deviation as great as 15%. Also, as an expediency, because they recognize that even dosimeters that are off by plus or minus 25% still provide valuable information, they also permit a label denoting a correction factor, but you need to keep in mind that dosimeters are not perfectly linear. The logic of preferring a high-range dosimeter rather than a low-range dosimeter is the same as for survey meters. We offer one model of high-range dosimeter (CD V-742) and they will all have been both successfully electrical leakage tested AND radiation exposure accuracy tested. They will have a certification sticker indicating such on them. Any dosimeters here that fail either test are put aside for possible future repairs, if/when we expand into that service. The delivered prices for each dosimeter, and for dosimeter chargers can be seen here! Q: I Already Have a Radiation Detection Survey Meter or Dosimeter, Can You Calibrate It? We can calibrate any of the CDV series radiation detectors survey meters and dosimeters and many other brands, as well. 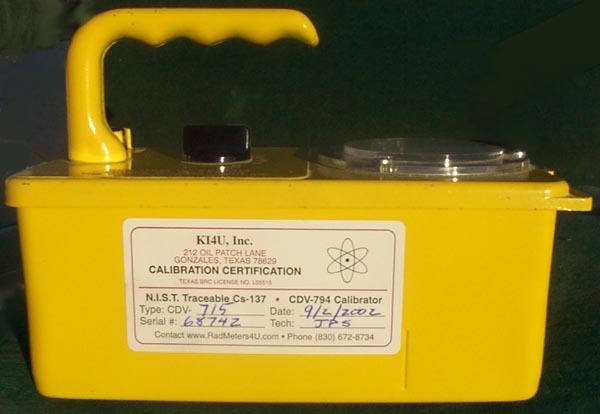 KI4U, Inc. is licensed and authorized by the State of Texas to perform these calibrations at our lab conforming to the standards as set forth by the State of Texas, FEMA, ASTM and the NRC. Complete details on having your Civil Defense radiation detection survey meters, dosimeters, or any type radiation detector calibrated are here. FYI, if somehow you are ever stuck with an un-calibrated radiation detector meter in a future nuclear emergency you might could find some use for it if a known calibrated meter is also handy. If/when the time comes and you find yourself in an actual radiation field, you could use it (the calibrated meter) to also test against your other (un-calibrated) meters reliability and accuracy. If one of your current, un-calibrated, meters reads high or low compared to the calibrated meter, then you could mark on it a correction factor denoting that meters particular variance from a true reading. This would allow you to then get some useful service out of it while keeping the correction factor in mind. That's a much better use of any un-calibrated instruments, rather than having them sit on a shelf unused in an ongoing nuclear emergency or selling or giving them to somebody else that doesn't know how important it is to only rely on a recently calibrated meter for protecting their own family. Q: What other type radiation detectors, meters, Civil Defense or not, are available? And, what other instruction in CD instruments is available? 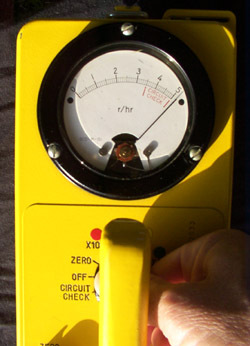 A: We have some other small quantities of calibrated Civil Defense low-range CD V-700's, and a few 'exotics', available that you can see here at http://www.radmeters4u.com/more.htm. There you'll see rugged 3-meters-in-one Aerial Fallout systems for use in airplanes to detect and map radioactive fallout. (Which work just fine for gamma detection here on the ground, too.) Also, Civil Defense fallout radiation barrier demonstration units that can be utilized by educational facilities or their detectors/meters possibly incorporated into a remote monitoring station. We also have some bench top G-M tube lab meters (CD V-457) and a limited number of 'enhanced' CD V-700's, as well as the external speakers (CD V-705's) and large probe housings for them, too. Details, pricing and ordering information for them all will be seen there at that page linked above. FINALLY: It's also vitally essential to learn how to properly use your CD instrument to then appreciate what they can reveal to you. The best reference is the FEMA 'RADIATION SAFETY IN SHELTERS' 120 page handbook. 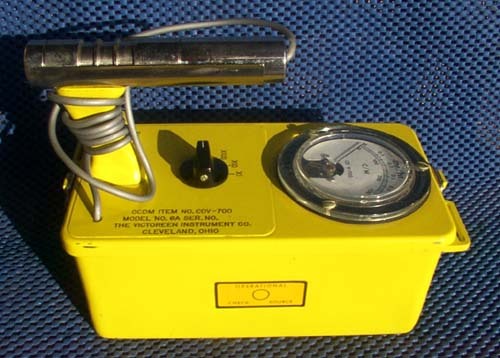 It is the premier instructional resource for the practical field use of these specific Civil Defense instruments calibrated here and sold on our site, in a for-real nuclear emergency. Subtitled: "A handbook for finding and providing the best protection in shelters with the use of instruments for detecting nuclear radiation." This practical manual goes far beyond the limited coverage included in the brief manuals that come with the FEMA Civil Defense survey meters and dosimeters. This is a must-have for anyone with CD instruments. Buy a hard copy to store with your meter and/or read it on-line for free here. Also, be sure to check out the cutting edge NukAlert and new RADSticker seen here, too! Also, see our popular 'The Package' where you get all our most popular products at over a 25% discount! !